Blaise Pascal (/pæˈskæl, pɑːˈskɑːl/; French: [blɛz paskal]; 19 June 1623 – 19 August 1662) was a French mathematician, physicist, inventor, writer and Catholic theologian. He was a child prodigy who was educated by his father, a tax collector in Rouen. Pascal's earliest work was in the natural and applied sciences where he made important contributions to the study of fluids, and clarified the concepts of pressure and vacuum by generalising the work of Evangelista Torricelli. Pascal also wrote in defence of the scientific method. In 1642, while still a teenager, he started some pioneering work on calculating machines. After three years of effort and 50 prototypes, he built 20 finished machines (called Pascal's calculators and later Pascalines) over the following 10 years, establishing him as one of the first two inventors of the mechanical calculator. 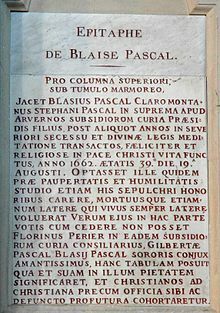 Pascal was an important mathematician, helping create two major new areas of research: he wrote a significant treatise on the subject of projective geometry at the age of 16, and later corresponded with Pierre de Fermat on probability theory, strongly influencing the development of modern economics and social science. Following Galileo Galilei and Torricelli, in 1647, he rebutted Aristotle's followers who insisted that nature abhors a vacuum. Pascal's results caused many disputes before being accepted. In 1646, he and his sister Jacqueline identified with the religious movement within Catholicism known by its detractors as Jansenism. Following a religious experience in late 1654, he began writing influential works on philosophy and theology. His two most famous works date from this period: the Lettres provinciales and the Pensées, the former set in the conflict between Jansenists and Jesuits. In that year, he also wrote an important treatise on the arithmetical triangle. Between 1658 and 1659, he wrote on the cycloid and its use in calculating the volume of solids. Throughout his life, Pascal was in frail health, especially after the age of 18; he died just two months after his 39th birthday. Pascal was born in Clermont-Ferrand, which is in France's Auvergne region. He lost his mother, Antoinette Begon, at the age of three. His father, Étienne Pascal (1588–1651), who also had an interest in science and mathematics, was a local judge and member of the "Noblesse de Robe". Pascal had two sisters, the younger Jacqueline and the elder Gilberte. In 1631, five years after the death of his wife, Étienne Pascal moved with his children to Paris. The newly arrived family soon hired Louise Delfault, a maid who eventually became an instrumental member of the family. Étienne, who never remarried, decided that he alone would educate his children, for they all showed extraordinary intellectual ability, particularly his son Blaise. The young Pascal showed an amazing aptitude for mathematics and science. Particularly of interest to Pascal was a work of Desargues on conic sections. Following Desargues' thinking, the 16-year-old Pascal produced, as a means of proof, a short treatise on what was called the "Mystic Hexagram", Essai pour les coniques ("Essay on Conics") and sent it—his first serious work of mathematics—to Père Mersenne in Paris; it is known still today as Pascal's theorem. It states that if a hexagon is inscribed in a circle (or conic) then the three intersection points of opposite sides lie on a line (called the Pascal line). 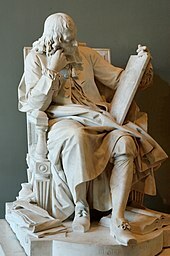 Pascal's work was so precocious that Descartes was convinced that Pascal's father had written it. When assured by Mersenne that it was, indeed, the product of the son and not the father, Descartes dismissed it with a sniff: "I do not find it strange that he has offered demonstrations about conics more appropriate than those of the ancients," adding, "but other matters related to this subject can be proposed that would scarcely occur to a 16-year-old child." In France at that time offices and positions could be—and were—bought and sold. In 1631, Étienne sold his position as second president of the Cour des Aides for 65,665 livres. The money was invested in a government bond which provided, if not a lavish, then certainly a comfortable income which allowed the Pascal family to move to, and enjoy, Paris. But in 1638 Richelieu, desperate for money to carry on the Thirty Years' War, defaulted on the government's bonds. Suddenly Étienne Pascal's worth had dropped from nearly 66,000 livres to less than 7,300. Like so many others, Étienne was eventually forced to flee Paris because of his opposition to the fiscal policies of Cardinal Richelieu, leaving his three children in the care of his neighbour Madame Sainctot, a great beauty with an infamous past who kept one of the most glittering and intellectual salons in all France. It was only when Jacqueline performed well in a children's play with Richelieu in attendance that Étienne was pardoned. In time, Étienne was back in good graces with the cardinal and in 1639 had been appointed the king's commissioner of taxes in the city of Rouen—a city whose tax records, thanks to uprisings, were in utter chaos. In 1642, in an effort to ease his father's endless, exhausting calculations, and recalculations, of taxes owed and paid (into which work the young Pascal had been recruited), Pascal, not yet 19, constructed a mechanical calculator capable of addition and subtraction, called Pascal's calculator or the Pascaline. Of the eight Pascalines known to have survived, four are held by the Musée des Arts et Métiers in Paris and one more by the Zwinger museum in Dresden, Germany, exhibit two of his original mechanical calculators. Although these machines are pioneering forerunners to a further 400 years of development of mechanical methods of calculation, and in a sense to the later field of computer engineering, the calculator failed to be a great commercial success. Partly because it was still quite cumbersome to use in practice, but probably primarily because it was extraordinarily expensive, the Pascaline became little more than a toy, and a status symbol, for the very rich both in France and elsewhere in Europe. Pascal continued to make improvements to his design through the next decade, and he refers to some 50 machines that were built to his design. Pascal's triangle. Each number is the sum of the two directly above it. The triangle demonstrates many mathematical properties in addition to showing binomial coefficients. In 1654, he proved Pascal's identity relating the sums of the p-th powers of the first n positive integers for p = 0, 1, 2, ..., k.
In 1654, prompted by his friend the Chevalier de Méré, he corresponded with Pierre de Fermat on the subject of gambling problems, and from that collaboration was born the mathematical theory of probabilities. The specific problem was that of two players who want to finish a game early and, given the current circumstances of the game, want to divide the stakes fairly, based on the chance each has of winning the game from that point. From this discussion, the notion of expected value was introduced. Pascal later (in the Pensées) used a probabilistic argument, Pascal's Wager, to justify belief in God and a virtuous life. The work done by Fermat and Pascal into the calculus of probabilities laid important groundwork for Leibniz' formulation of the calculus. After a religious experience in 1654, Pascal mostly gave up work in mathematics. Pascal's major contribution to the philosophy of mathematics came with his De l'Esprit géométrique ("Of the Geometrical Spirit"), originally written as a preface to a geometry textbook for one of the famous "Petites-Ecoles de Port-Royal" ("Little Schools of Port-Royal"). The work was unpublished until over a century after his death. Here, Pascal looked into the issue of discovering truths, arguing that the ideal of such a method would be to found all propositions on already established truths. At the same time, however, he claimed this was impossible because such established truths would require other truths to back them up—first principles, therefore, cannot be reached. Based on this, Pascal argued that the procedure used in geometry was as perfect as possible, with certain principles assumed and other propositions developed from them. Nevertheless, there was no way to know the assumed principles to be true. Pascal also used De l'Esprit géométrique to develop a theory of definition. He distinguished between definitions which are conventional labels defined by the writer and definitions which are within the language and understood by everyone because they naturally designate their referent. The second type would be characteristic of the philosophy of essentialism. Pascal claimed that only definitions of the first type were important to science and mathematics, arguing that those fields should adopt the philosophy of formalism as formulated by Descartes. In De l'Art de persuader ("On the Art of Persuasion"), Pascal looked deeper into geometry's axiomatic method, specifically the question of how people come to be convinced of the axioms upon which later conclusions are based. Pascal agreed with Montaigne that achieving certainty in these axioms and conclusions through human methods is impossible. He asserted that these principles can be grasped only through intuition, and that this fact underscored the necessity for submission to God in searching out truths. Pascal's work in the fields of the study of hydrodynamics and hydrostatics centered on the principles of hydraulic fluids. His inventions include the hydraulic press (using hydraulic pressure to multiply force) and the syringe. He proved that hydrostatic pressure depends not on the weight of the fluid but on the elevation difference. He demonstrated this principle by attaching a thin tube to a barrel full of water and filling the tube with water up to the level of the third floor of a building. This caused the barrel to leak, in what became known as Pascal's barrel experiment. Light passed through the so-called "vacuum" in the glass tube. Aristotle wrote how everything moved, and must be moved by something. Therefore, since there had to be an invisible "something" to move the light through the glass tube, there was no vacuum in the tube. Not in the glass tube or anywhere else. Vacuums – the absence of any and everything – were simply an impossibility. Following more experimentation in this vein, in 1647 Pascal produced Experiences nouvelles touchant le vide ("New experiments with the vacuum"), which detailed basic rules describing to what degree various liquids could be supported by air pressure. It also provided reasons why it was indeed a vacuum above the column of liquid in a barometer tube. This work was followed by Récit de la grande expérience de l'équilibre des liqueurs ("Account of the great experiment on equilibrium in liquids") published in 1648. 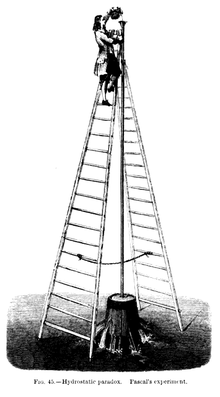 Pascal replicated the experiment in Paris by carrying a barometer up to the top of the bell tower at the church of Saint-Jacques-de-la-Boucherie, a height of about 50 metres. The mercury dropped two lines. In the face of criticism that some invisible matter must exist in Pascal's empty space, Pascal, in his reply to Estienne Noel, gave one of the 17th century's major statements on the scientific method, which is a striking anticipation of the idea popularised by Karl Popper that scientific theories are characterised by their falsifiability: "In order to show that a hypothesis is evident, it does not suffice that all the phenomena follow from it; instead, if it leads to something contrary to a single one of the phenomena, that suffices to establish its falsity." His insistence on the existence of the vacuum also led to conflict with other prominent scientists, including Descartes. Pascal introduced a primitive form of roulette and the roulette wheel in his search for a perpetual motion machine. In the winter of 1646, Pascal's 58-year-old father broke his hip when he slipped and fell on an icy street of Rouen; given the man's age and the state of medicine in the 17th century, a broken hip could be a very serious condition, perhaps even fatal. Rouen was home to two of the finest doctors in France: Monsieur Doctor Deslandes and Monsieur Doctor de La Bouteillerie. The elder Pascal "would not let anyone other than these men attend him...It was a good choice, for the old man survived and was able to walk again..." But treatment and rehabilitation took three months, during which time La Bouteillerie and Deslandes had become regular visitors. Both men were followers of Jean Guillebert, proponent of a splinter group from Catholic teaching known as Jansenism. This still fairly small sect was making surprising inroads into the French Catholic community at that time. It espoused rigorous Augustinism. Blaise spoke with the doctors frequently, and after their successful treatment of his father, borrowed from them works by Jansenist authors. In this period, Pascal experienced a sort of "first conversion" and began to write on theological subjects in the course of the following year. Pascal fell away from this initial religious engagement and experienced a few years of what some biographers have called his "worldly period" (1648–54). His father died in 1651 and left his inheritance to Pascal and his sister Jacqueline, for whom Pascal acted as conservator. Jacqueline announced that she would soon become a postulant in the Jansenist convent of Port-Royal. Pascal was deeply affected and very sad, not because of her choice, but because of his chronic poor health; he needed her just as she had needed him. Suddenly there was war in the Pascal household. Blaise pleaded with Jacqueline not to leave, but she was adamant. He commanded her to stay, but that didn't work, either. At the heart of this was...Blaise's fear of abandonment...if Jacqueline entered Port-Royal, she would have to leave her inheritance behind...[but] nothing would change her mind. By the end of October in 1651, a truce had been reached between brother and sister. In return for a healthy annual stipend, Jacqueline signed over her part of the inheritance to her brother. Gilberte had already been given her inheritance in the form of a dowry. In early January, Jacqueline left for Port-Royal. On that day, according to Gilberte concerning her brother, "He retired very sadly to his rooms without seeing Jacqueline, who was waiting in the little parlor..." In early June 1653, after what must have seemed like endless badgering from Jacqueline, Pascal formally signed over the whole of his sister's inheritance to Port-Royal, which, to him, "had begun to smell like a cult." With two thirds of his father's estate now gone, the 29-year-old Pascal was now consigned to genteel poverty. For a while, Pascal pursued the life of a bachelor. During visits to his sister at Port-Royal in 1654, he displayed contempt for affairs of the world but was not drawn to God. On 23 November 1654, between 10:30 and 12:30 at night, Pascal had an intense religious vision and immediately recorded the experience in a brief note to himself which began: "Fire. God of Abraham, God of Isaac, God of Jacob, not of the philosophers and the scholars..." and concluded by quoting Psalm 119:16: "I will not forget thy word. Amen." He seems to have carefully sewn this document into his coat and always transferred it when he changed clothes; a servant discovered it only by chance after his death. This piece is now known as the Memorial. The story of the carriage accident[clarification needed] as having led to the experience described in the Memorial is disputed by some scholars. His belief and religious commitment revitalized, Pascal visited the older of two convents at Port-Royal for a two-week retreat in January 1655. For the next four years, he regularly travelled between Port-Royal and Paris. It was at this point immediately after his conversion when he began writing his first major literary work on religion, the Provincial Letters. Beginning in 1656–57, Pascal published his memorable attack on casuistry, a popular ethical method used by Catholic thinkers in the early modern period (especially the Jesuits, and in particular Antonio Escobar). Pascal denounced casuistry as the mere use of complex reasoning to justify moral laxity and all sorts of sins. The 18-letter series was published between 1656 and 1657 under the pseudonym Louis de Montalte and incensed Louis XIV. The king ordered that the book be shredded and burnt in 1660. In 1661, in the midsts of the formulary controversy, the Jansenist school at Port-Royal was condemned and closed down; those involved with the school had to sign a 1656 papal bull condemning the teachings of Jansen as heretical. The final letter from Pascal, in 1657, had defied Alexander VII himself. Even Pope Alexander, while publicly opposing them, nonetheless was persuaded by Pascal's arguments. Aside from their religious influence, the Provincial Letters were popular as a literary work. Pascal's use of humor, mockery, and vicious satire in his arguments made the letters ripe for public consumption, and influenced the prose of later French writers like Voltaire and Jean-Jacques Rousseau. Charles Perrault wrote of the Letters: "Everything is there—purity of language, nobility of thought, solidity in reasoning, finesse in raillery, and throughout an agrément not to be found anywhere else." Pascal's most influential theological work, referred to posthumously as the Pensées ("Thoughts"), was not completed before his death. It was to have been a sustained and coherent examination and defense of the Christian faith, with the original title Apologie de la religion Chrétienne ("Defense of the Christian Religion"). The first version of the numerous scraps of paper found after his death appeared in print as a book in 1669 titled Pensées de M. Pascal sur la religion, et sur quelques autres sujets ("Thoughts of M. Pascal on religion, and on some other subjects") and soon thereafter became a classic. One of the Apologie's main strategies was to use the contradictory philosophies of skepticism and stoicism, personalized by Montaigne on one hand, and Epictetus on the other, in order to bring the unbeliever to such despair and confusion that he would embrace God. Pascal's Pensées is widely considered to be a masterpiece, and a landmark in French prose. When commenting on one particular section (Thought #72), Sainte-Beuve praised it as the finest pages in the French language. Will Durant hailed the Pensées as "the most eloquent book in French prose". T. S. Eliot described him during this phase of his life as "a man of the world among ascetics, and an ascetic among men of the world." Pascal's ascetic lifestyle derived from a belief that it was natural and necessary for a person to suffer. In 1659, Pascal fell seriously ill. During his last years, he frequently tried to reject the ministrations of his doctors, saying, "Sickness is the natural state of Christians." Louis XIV suppressed the Jansenist movement at Port-Royal in 1661. In response, Pascal wrote one of his final works, Écrit sur la signature du formulaire ("Writ on the Signing of the Form"), exhorting the Jansenists not to give in. Later that year, his sister Jacqueline died, which convinced Pascal to cease his polemics on Jansenism. Pascal's last major achievement, returning to his mechanical genius, was inaugurating perhaps the first bus line, the carrosses à cinq sols, moving passengers within Paris in a carriage with many seats. In 1662, Pascal's illness became more violent, and his emotional condition had severely worsened since his sister's death. Aware that his health was fading quickly, he sought a move to the hospital for incurable diseases, but his doctors declared that he was too unstable to be carried. In Paris on 18 August 1662, Pascal went into convulsions and received extreme unction. He died the next morning, his last words being "May God never abandon me," and was buried in the cemetery of Saint-Étienne-du-Mont. An autopsy performed after his death revealed grave problems with his stomach and other organs of his abdomen, along with damage to his brain. Despite the autopsy, the cause of his poor health was never precisely determined, though speculation focuses on tuberculosis, stomach cancer, or a combination of the two. The headaches which afflicted Pascal are generally attributed to his brain lesion. Death mask of Blaise Pascal. In honour of his scientific contributions, the name Pascal has been given to the SI unit of pressure, to a programming language, and Pascal's law (an important principle of hydrostatics), and as mentioned above, Pascal's triangle and Pascal's wager still bear his name. Pascal's development of probability theory was his most influential contribution to mathematics. Originally applied to gambling, today it is extremely important in economics, especially in actuarial science. John Ross writes, "Probability theory and the discoveries following it changed the way we regard uncertainty, risk, decision-making, and an individual's and society's ability to influence the course of future events." However, it should be noted that Pascal and Fermat, though doing important early work in probability theory, did not develop the field very far. Christiaan Huygens, learning of the subject from the correspondence of Pascal and Fermat, wrote the first book on the subject. Later figures who continued the development of the theory include Abraham de Moivre and Pierre-Simon Laplace. In literature, Pascal is regarded as one of the most important authors of the French Classical Period and is read today as one of the greatest masters of French prose. His use of satire and wit influenced later polemicists. The content of his literary work is best remembered for its strong opposition to the rationalism of René Descartes and simultaneous assertion that the main countervailing philosophy, empiricism, was also insufficient for determining major truths. In France, prestigious annual awards, Blaise Pascal Chairs are given to outstanding international scientists to conduct their research in the Ile de France region. One of the Universities of Clermont-Ferrand, France – Université Blaise Pascal – is named after him. The University of Waterloo, Ontario, Canada, holds an annual math contest named in his honour. Pascalian theology has grown out of his perspective that we are, according to Wood, "born into a duplicitous world that shapes us into duplicitous subjects and so we find it easy to reject God continually and deceive ourselves about our own sinfulness". Roberto Rossellini directed a filmed biopic, Blaise Pascal, which originally aired on Italian television in 1971. Pascal was a subject of the first edition of the 1984 BBC Two documentary, Sea of Faith, presented by Don Cupitt. In 2014, Nvidia announced its new Pascal microarchitecture, which is named for Pascal. The first graphics cards featuring Pascal were released in 2016. The 2017 game Nier: Automata has multiple characters named after famous philosophers; one of these is a sentient pacifistic machine named Pascal, who serves as a major supporting character. Pascal creates a village for machines to live peacefully with the androids they're at war with and acts as a parental figure for other machines trying to adapt to their newly-found individuality. ^ Vincent Jullien (ed. ), Seventeenth-Century Indivisibles Revisited, Birkhäuser, 2015, p. 188. ^ a b O'Connor, J.J.; Robertson, E.F. (August 2006). "Étienne Pascal". University of St. Andrews, Scotland. Retrieved 5 February 2010. ^ "Pascal". Random House Webster's Unabridged Dictionary. ^ Mourlevat, Guy (1988). Les machines arithmétiques de Blaise Pascal (in French). Clermont-Ferrand: La Française d'Edition et d'Imprimerie. p. 12. ^ See Schickard versus Pascal: An Empty Debate? and Marguin, Jean (1994). Histoire des instruments et machines à calculer, trois siècles de mécanique pensante 1642–1942 (in French). Hermann. p. 48. ISBN 978-2-7056-6166-3. ^ d'Ocagne, Maurice (1893). Le calcul simplifié (in French). Gauthier-Villars et fils. p. 245. ^ "Blaise Pascal". Catholic Encyclopedia. Retrieved 23 February 2009. ^ Kieren MacMillan, Jonathan Sondow (2011). "Proofs of power sum and binomial coefficient congruences via Pascal's identity". American Mathematical Monthly. 118 (6): 549–551. arXiv:1011.0076. doi:10.4169/amer.math.monthly.118.06.549. ^ "The Mathematical Leibniz". Math.rutgers.edu. Retrieved 16 August 2009. ^ Aristotle, Physics, VII, 1. ^ Ley, Willy (June 1966). "The Re-Designed Solar System". For Your Information. Galaxy Science Fiction. pp. 94–106. ^ Périer to Pascal, 22 September 1648, Pascal, Blaise. Oeuvres complètes. (Paris: Seuil, 1960), 2:682. ^ MIT, "Inventor of the Week Archive: Pascal : Mechanical Calculator", May 2003. "Pascal worked on many versions of the devices, leading to his attempt to create a perpetual motion machine. He has been credited with introducing the roulette machine, which was a by-product of these experiments." ^ MathPages, Hold Your Horses. For the sources on which the hypothesis of a link between a carriage accident and Pascal's second conversion is based, and for a sage weighing of the evidence for and against, see Henri Gouhier, Blaise Pascal: Commentaires, Vrin, 1984, pp. 379ff. ^ Charles Perrault, Parallèle des Anciens et des Modernes (Paris, 1693), Vol. I, p. 296. ^ Sainte-Beuve, Seventeenth Century ISBN 1-113-16675-4 p. 174 (2009 reprint). ^ a b Muir, Jane. Of Men and Numbers. (New York: Dover Publications, Inc, 1996). ISBN 0-486-28973-7, p. 104. ^ Muir, Jane. Of Men and Numbers. (New York: Dover Publications, Inc, 1996). ISBN 0-486-28973-7, p. 103. ^ Ross, John F. (2004). "Pascal's legacy". EMBO Reports. 5 (Suppl 1): S7–S10. doi:10.1038/sj.embor.7400229. PMC 1299210. PMID 15459727. ^ "Chaires Blaise Pascal". Chaires Blaise Pascal. Archived from the original on 13 June 2009. Retrieved 16 August 2009. ^ "CEMC – Pascal, Cayley and Fermat – Mathematics Contests – University of Waterloo". Cemc.uwaterloo.ca. 23 June 2008. Retrieved 16 August 2009. ^ Blaise Pascal on Duplicity, Sin, and the Fall. global.oup.com. Changing Paradigms in Historical and Systematic Theology. Oxford University Press. 4 July 2013. ISBN 9780199656363. Retrieved 24 March 2016. ^ David Pengelley - "Pascal's Treatise on the Arithmetical Triangle"
Adamson, Donald. "Pascal's Views on Mathematics and the Divine," Mathematics and the Divine: A Historical Study (eds. T. Koetsier and L. Bergmans. Amsterdam: Elsevier 2005), pp. 407–21. Davidson, Hugh M. Blaise Pascal. (Boston: Twayne Publishers), 1983. Devlin, Keith (2008). The Unfinished Game: Pascal, Fermat, and the Seventeenth-Century Letter that Made the World Modern. New York: Basic Books. ISBN 978-0-465-00910-7. Farrell, John. "Pascal and Power". Chapter seven of Paranoia and Modernity: Cervantes to Rousseau (Cornell UP, 2006). Goldmann, Lucien, The hidden God; a study of tragic vision in the Pensees of Pascal and the tragedies of Racine (original ed. 1955, Trans. Philip Thody. London: Routledge, 1964). Jordan, Jeff. Pascal's Wager: Pragmatic Arguments and Belief in God. (Oxford: Clarendon Press, 2006). Landkildehus, Søren. "Kierkegaard and Pascal as kindred spirits in the Fight against Christendom" in Kierkegaard and the Renaissance and Modern Traditions (ed. Jon Stewart. Farnham: Ashgate Publishing, 2009). Mackie, John Leslie. The Miracle of Theism: Arguments for and against the Existence of God. (Oxford: Oxford University Press, 1982). Pugh, Anthony R. The Composition of Pascal's Apologia, (University of Toronto Press, 1984). Saka, Paul (2001). "Pascal's Wager and the Many Gods Objection". Religious Studies. 37 (3): 321–41. doi:10.1017/S0034412501005686. Stephen, Leslie. "Pascal" . Studies of a Biographer. 2. London: Duckworth and Co. pp. 241–284. Tobin, Paul. "The Rejection of Pascal's Wager: A Skeptic's Guide to the Bible and the Historical Jesus". authorsonline.co.uk, 2009. Simpson, David. ""Blaise Pascal"". Internet Encyclopedia of Philosophy. Clarke, Desmond. "Blaise Pascal". In Zalta, Edward N. (ed.). Stanford Encyclopedia of Philosophy. Pascal's Memorial in orig. French/Latin and modern English, trans. Elizabeth T. Knuth. BBC Radio 4. In Our Time: Pascal. Blaise Pascal featured on the 500 French Franc banknote in 1977. "Blaise Pascal" . Catholic Encyclopedia. 1913. Etext of a number of Pascal's minor works (English translation) including, De l'Esprit géométrique and De l'Art de persuader. O'Connor, John J.; Robertson, Edmund F., "Blaise Pascal", MacTutor History of Mathematics archive, University of St Andrews .